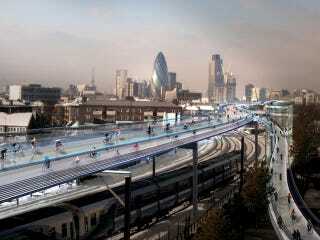 Will London soon have a bikes-only highway rising high over the city? Well, maybe. The plans have been released, but whether it will actually be built is up in the air. SkyCycle proposes a network of elevated bike paths hoisted aloft above railway lines, allowing you to zip through town blissfully liberated from the roads. The project, which has the backing of Network Rail and Transport for London, would see over 220km of car-free routes installed above London's suburban rail network, suspended on pylons above the tracks and accessed at over 200 entrance points. At up to 15 metres wide, each of the ten routes would accommodate 12,000 cyclists per hour and improve journey times by up to 29 minutes, according to the designers. The path would be built above the existing rail-lines, using the platforms over railway stations as guideposts. So what's the hold-up? Unsurprisingly, it's money. The Guardian also raises the sad specter of California's own attempt at an aerial bike path, attempted over 100 years ago. The early bike-path of the future, designed to link Pasadena and Los Angeles with a cyclists-exclusive wooden roadway, never managed to get enough funding to break through. At a cost of about $360 million to build, SkyCycle could take awhile to get off the ground as well.